Welcome to Nami Island ! Located at an altitude of 710 meters above sea level, which is about 220 km from Christchurch, Tekapo Lake has a reputation as a place with the cleanest air in the southern hemisphere. If the day is sunny, it is becoming the best opportunity to get the great Southern Alps mountain photo. Parts of Lake Tekapo most interesting is the color of the lake water is amazing. The Light stone reflection from particles trapped in glacier melt water results provide a beautiful blue color. Bus that connects Christchurch and Queenstown will stop near a row of shops in the town center. There, visitors can stop at the i-Site to get information. All visitors who come to Lake Tekapo definitely will not miss the Church of the Good Shepard, a small church building of stone in the edge of the lake, was established in 1953 as a memorial to the predecessors who first paved the way and find the area. Visitors can enjoy the church from the outside or go into it without having to pay. One hundred meters to the east of the church, there is a Collie Dog Monument, which was established in 1968 by the owners of a local farm with a view to considering the types of service dogs who used to help in the farm. With the minimal level of light pollution, the peak of Mount John is located at 9 km southwest Tekapo offers Stargazing Tour rehabilitated and reconstructed telescope at their disposal. In addition to entering into the observatory during the day, tourists can also come to observe the constellations at night. If you don’t use personal vehicle, try to grab Earth & Sky Tour package. During the day, tour tariff for 45 minutes about 50 NZD to 25 NZD for adults and children. And, at night, the tour lasted for approximately 2 hours with a tariff of 125 NZD to 75 NZD for adults and children ages from 8 and up. Children less than 8 years of age isn’t recommended to follow this tour because the weather is cold and dark and long duration of activity, not suitable for small children. A wide selection of other activities during the day is a lake or a sightseeing tour operators offered waterskiing Cruise Tekapo with tariff of about 40 to 125 NZD. After tired with activities all day, travelers can head to Alpine Springs complex. There are hot tubs outdoor temperature of 40 degrees Celsius. Hot water isn’t natural, but pretty can make the body relax, especially the air is cold and the child. In this complex there is a skating rink and snow tubing. Heated pool complex is open from 10 am to 9 pm. The admission price is about 20 NZD for adults, 11 NZD for children, and 16 NZD for above 60 years of age. While the steam ticket including hot tubs around 28 NZD for adults. If you just want to enjoy the sauna alone, travelers simply pay 10 NZD. Tickets skating rink for 12 NZD for children, 14 NZD for teens, and 21 NZD for adults. In addition there is also a family package for 2 adults with maximum 3 children for 61 NZD. For snow tubing, the park opened at 10 am and 7 pm every day in the winter, and 10 am to 9 pm in the summer. Tickets go for 1 session for 16 NZD for children, 20 NZD for adults, and 79 NZD for a family pack. The choice of accommodation in Lake Tekapo not much. Some of the recommended accommodation is as like Lakefront Backpackers Lodge is located at 2 Lakeside Drive, this place also offers a nuanced lake view of stone and wood building. This place has a capacity about 86 rooms with a variety of dorm to private rooms. Rental prices dorm around 30 NZD per person, while the private room of about 42.5 NZD per person. There are many bus operators from Christchurch to the Mt Cook, Wanaka, or Queenstown, which across Lake Tekapo. Christchurch travel usually take 4 hours. Atomic Shuttle departs from the front of the Canterbury Museum on Rolleston Avenue at 7 am. 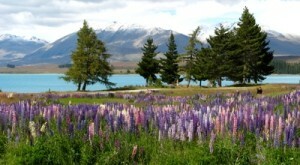 From the same place, Southern Link Coaches also ridden the bus to Lake Tekapo at 9 am. One-way ticket price of around 25 NZD. Restaurant selling good food at Lake Tekapo such as Astro Café which sells coffee and cake, which sells Kohan Japanese cuisine, and Pepe’s which sells pasta and pizza.